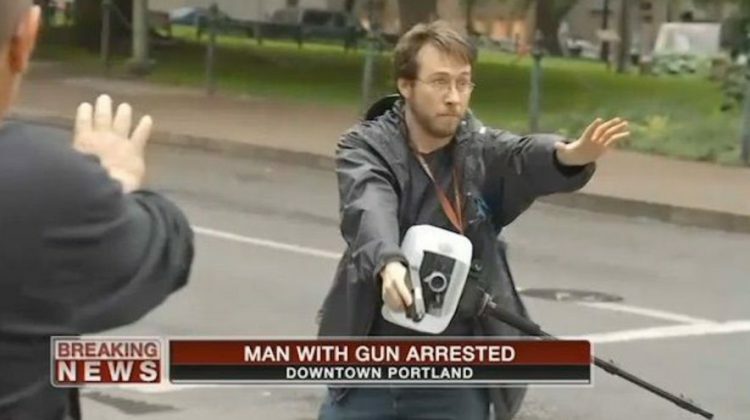 At his arraignment today at the Multnomah County Courthouse in downtown Portland Strickland was hit with two felony counts of “unlawful use of a weapon,” as well asmisdemeanor charges of menacing and disorderly conduct. Strickland said he was protecting himself, however he was found with 6 clips, one in the chamber and pulled the gun while a pretty far distance from protestors, aiming it at them. If convicted he could face 20 years. Of course I was curious to know which conservative blogs this alleged felon writes for, and guess where I found him? If you guessed Gateway Pundit, home of Jim Hoft, the fabled Stupidest Man on the Internet, you win. He’s written many posts for Hoft. Here’s the link to the Gateway Pundit index of Strickland’s articles, which often prominently featured guns, oddly enough: Michael Strickland, Author at The Gateway Pundit. And here’s his index at Progressives Today, another far right propaganda site started by the SMOTI: Michael Strickland, Author at Progressives Today. Strickland also was a huge supporter of the Bundy’s during their showdown with law enforcement. You know, where they didn’t acknowledge the power of law enforcement and responded by pointing guns at them. Ironically Strickland is being held in the same jail as two of the Bundy boys. That might make the shower a little extra special. Oh and Strickland is also a YUGEEEE Trump supporter, and Trump just loves him some Gateway Pundit as well. I wonder if Trump will offer to pay Strickland’s legal fees now?